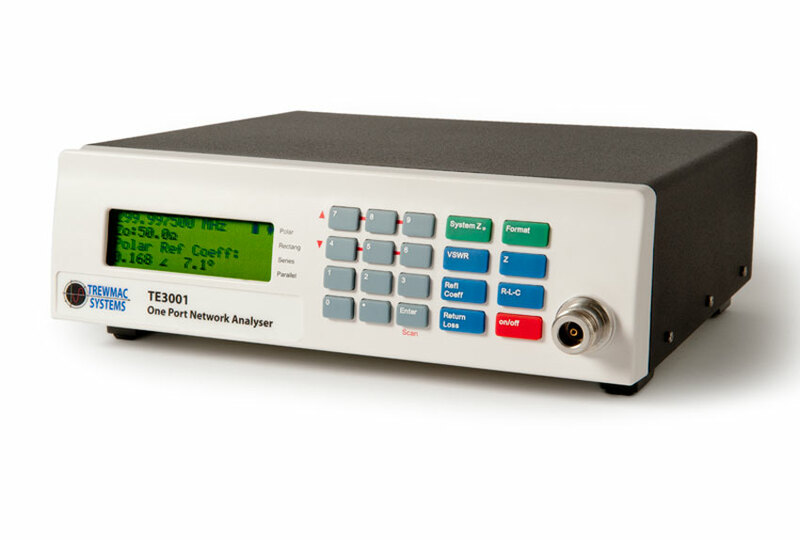 The TE3001 One Port Vector Network Analyser is built for the field professional who understands the calibration process and has a network analysis task to perform. The TE3001 is supplied with an N type male connector interface for standard network analysis. The unit features a larger output signal than the TE3000 for excellent noise immunity in noisy environments. It's supplied with a 3 piece male and 3 piece female calibration kit allowing the user to remove the effect of any linear test fixture or transmission line, and provide an unprecedented level of measurement accuracy. A tweezer attachment and associated calibration kit is available for component or crystal characterisation. With user variable averaging, a vast array of display formats and battery or mains power the TE3001 is ideal for broadcast and plasma applications where field and workshop measurements are required. To compliment this construction, the TE3001 software provides a powerful set of formats and charts for fast analysis, and interfaces with a simple USB. Features include smith charts, multi series plotting, difference plotting, curve smoothing, annotations, cursors, time domain reflectometry and interference spectrum scanning.